This news has surely surprised me, and it is probably a first world over. 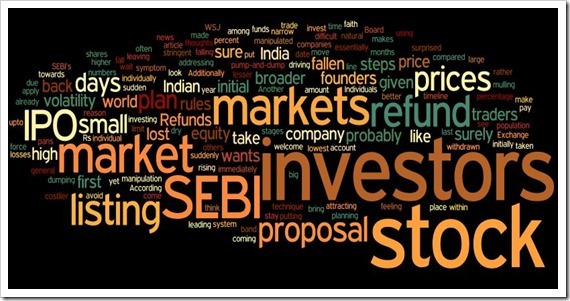 SEBI is mulling upon a refund plan for IPO investments in Indian stock markets. According to a article in WSJ, Securities and Exchange Board of India is planning to force founders of IPO companies to pay back the amount lost by small investors during the initial days after listing of an IPO. India has one of the lowest percentage of population investing in stock markets. Individuals and small investors stay away due to high volatility in the Indian stock markets, often leading to losses. SEBI wants to restore faith back in stock markets and wants more investors to look at equity as a safer instrument to invest. Another reason for SEBI to put a refund plan in place is because there is general feeling among investors that markets are being manipulated by few big investors and traders using pump-and-dump technique. What it means is, they buy shares initially in large numbers driving the prices of stocks up, attracting smaller investors towards it and then suddenly dumping the stock at higher price leaving others high and dry. This is a welcome move from SEBI, and would surely bring more individual investors to stock market. The proposal essentially makes sure that small investors will be safeguarded from sudden fall in prices after IPO listing. Having said that, we think it would be better for SEBI to take stringent steps to avoid market manipulation rather than addressing the symptom. No other market in the world has such a system, and rules like this probably are not in line with natural functioning of stock markets. We will have to wait and see how this proposal pans out before coming to any other conclusions. Coal India IPO – Mother of all IPOs! Investment banker who price the issue are thieves. They should also be made to pay upto 100% of their commissions. My views are a little skeptical from legal point of view. 1) When people say small investors, there are different types of small investors. Most come to IPOs for listing gains. (No problem with that). Lets say one IPO with price of 100. First day the small investor sold at 90 and lost 10 rupees. The guy who bought the share at 90 sold them at 80 and lost 10 rupees. The third guy who bought the share at 80 and sold at 70 and lost 10 rupees. As per the SEBI proposal, the loss of 30 will be reimbursed to the first investor? Will SEBi go on finding who lost? Is this SEBI job? People who come to IPOs know the risks involved. When they come with a intention of profit during Listing gains, they should also be prepared to face listing loss. If SEBI makes this a risk free way of making money, (no loss but only profit) every one who dont know stocks will start investing. 2) As per SEBI proposal, if the stock falls below 30% in the preceeding 30 days, the promoters have to refund loss. Consider a stock managing in the 0-30% loss after listing. If some trader want the promoter pay, he can make the stock come down beyond 30% for atleast one day. I am not sure how it is done but it is possible. So the promoter will be forced to pay. On one hand the well being of uneducated small investors have to be taken care of but also such draconian rules should not scare away promoters from market. After all in the end Indian economy will be effected if promoters shy away from market. However the concept is good and experts have to look for fool proof ways to protect each side. One suggestion I can give is SEBI should be tough when prospective promoters come out with any of IPO or FPO or OFS. The price band should be strictly discussed. Promoteres should not be allowed to price the band at higher end. A strict criteria should be placed. The price band is the main culprit. Not the promoters.